While I was reading my cookbook the other day, I found this recipe. 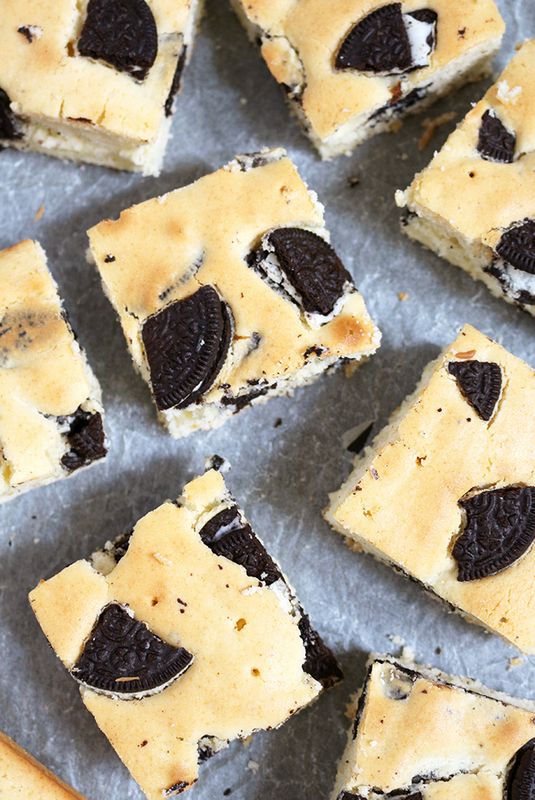 I have to say that I haven‘t made Oreo Cream Cheese bars for a long time. I‘ve prepared Chocolate Chip Cheesecake Cookies and Double Chocolate Cheesecake Cookies. Since, it‘s a fresh strawberry season I‘ve also made Easy Strawberry Banana Fluff Salad and Fresh Strawberry Cream Cheese Cake. 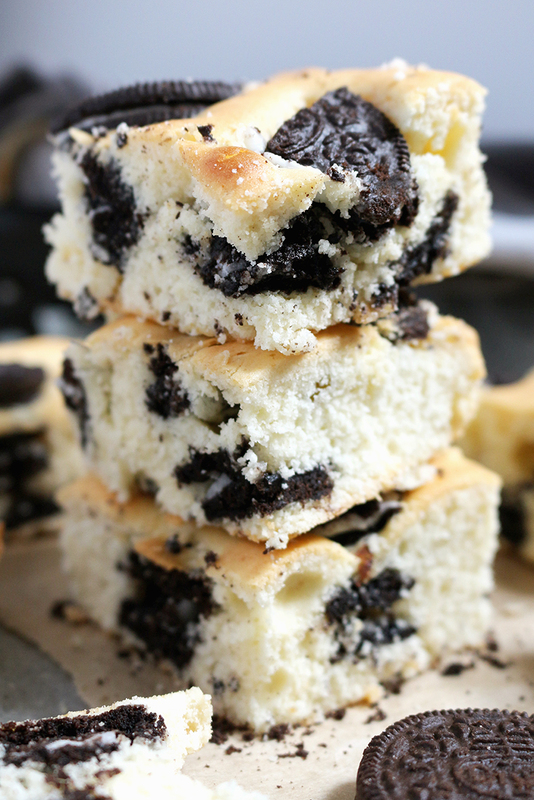 That‘s why I simply forgot about Oreo Cream Cheese Bars. I‘m now sharing the recipe with you. 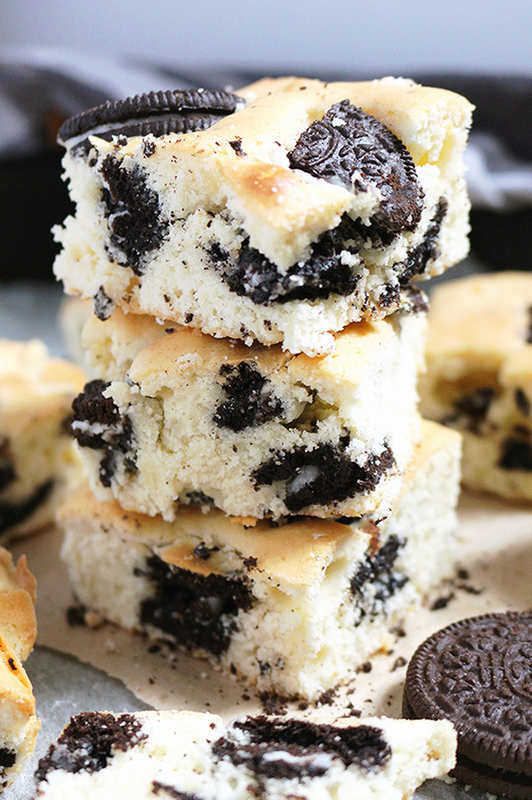 I usually make Oreo Cream Cheese bars for a snack. I enjoy their taste while I‘m having my coffee, reading newspapers and getting ready for a new day. My son loves them, especially Oreo cookies inside. Preheat oven to 375F. Line an 8x8 inch baking pan with parchment paper. Crumble Oreo cookies and set aside. In a medium dish combine flour, cornstarch and baking powder. Set aside. In a separate dish, mix butter and cream cheese with an electric mixer, medium speed, until it is creamy, for about a minute. Add en egg, vanilla, yogurt and mix some more. Add, powdered sugar and mix until creamy, for about a minute. Then, slowly add a flour mixture and mix until well combined. Take a handful of crumbled cookies and leave aside. Add the remaining cookies in the dough and stir gently. 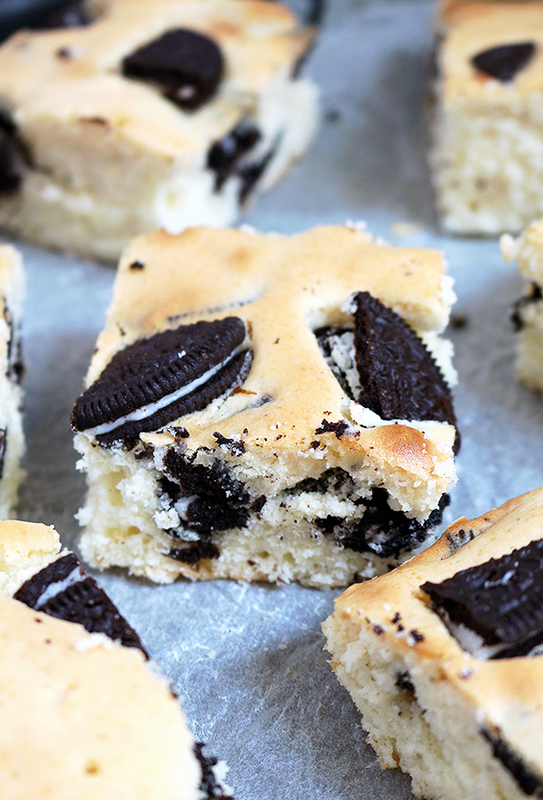 Put the mixture in the baking pan, spread evenly and sprinkle with a handful of Oreo, you have already separated. Put in the oven and after 10 minutes, put parchment paper over it, so that it doesn‘t become too brown, while baking. Bake for 25-27 min or until a toothpick comes out clean. Take out of the oven and leave to cool for a while. Transfer to a wire rack to cool completely. If you prefer sweeter desserts, add a ¼ cup of sugar max. Store at a room temperature, in a well sealed container, no longer than 2 days.